This idea came to me in a "no duh!" type of way. 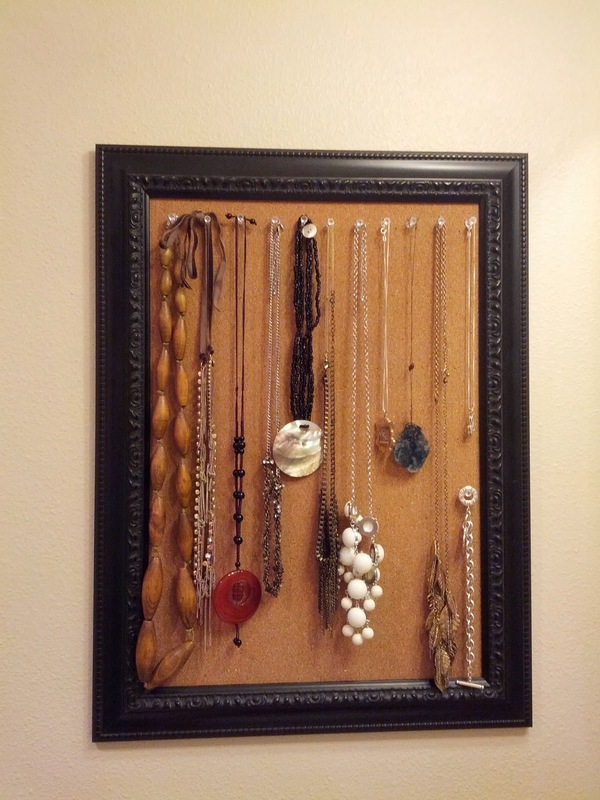 I've seen corkboard jewelry holders like this before - the one that springs to mind belongs to one of my girlfriends, and then of course, I'm sure I've also seen similar ones on Pinterest. I have this beautiful wooden box that housed all my jewelry (which I hardly ever wear), but it was bursting at the seems with all my bling. Which is ironic, since I never considered myself a jewelry girl in the first place, but then we went ahead and threw a grabby baby in the mix and now the LAST thing I want on my body is something pulling on my neck or getting tangled in my hair or around Henry's fingers. Only I actually really like my necklaces and kind of would like to wear them more? Question mark? This is they type of conflict I struggle with. I had originally tried to turn this corkboard into a calendar. I made a grid using washi tape, and cut little squares of paper to stick up there with push pins. The whole thing would have been adorable if it wasn't ugly. Isn't that so with all ugly things? Anyway, it ended up being a sad waste of washi tape - almost a whole roll of it - but I'm glad I decided to nix the calendar and go with the jewelry holder. There's a few things about the whole situation. First, I already got a large desk calendar that was actually, you know, a calendar, and not a corkboard with washi tape and pushpins. Second, bare walls make a house feel like you just moved in, and my master bathroom was all walls-y. And we've lived here for, what? Three years now? It was time to make some holes. 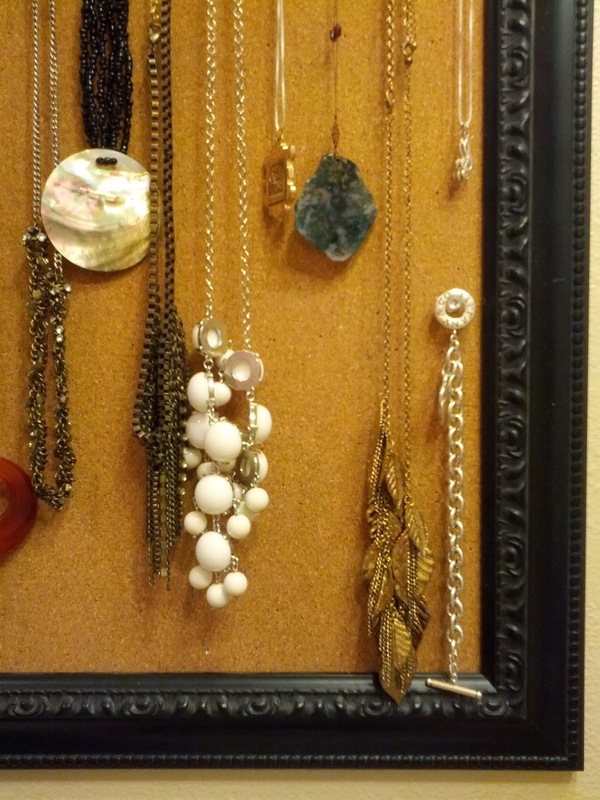 (For this reason I finally hung pictures in gallery fashion in our living room) And third, I knew if my jewelry was in plain sight when I was getting ready in the mornings, I'd be more likely to actually put some of it on. 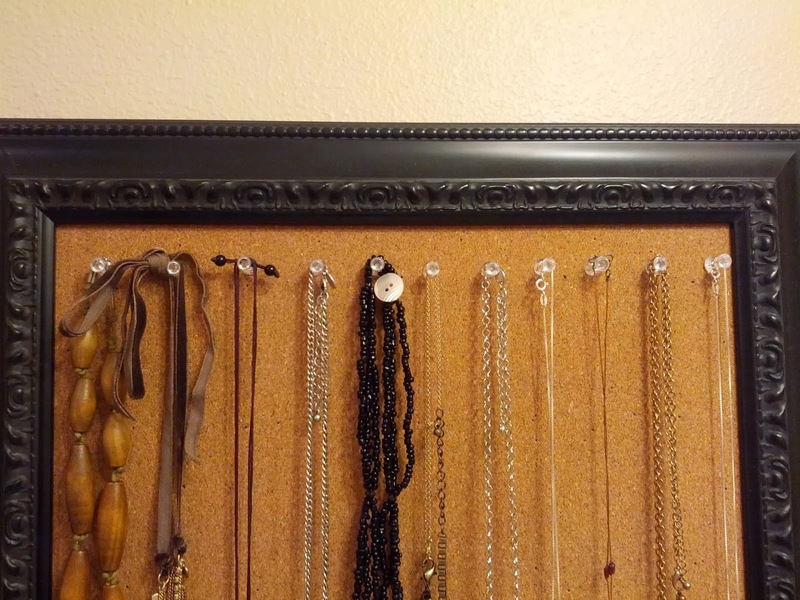 I pushed some pins (I've gone and made it sound like I hate pushpins, but they're really wonderful things) about an inch apart across the top and hung my necklaces on it. A couple of my necklaces were shorter and I was able to push one in about halfway down to hang the one and only bracelet I've ever been happy to wear in my life. I would have hung my men's watches, too, but I figured I should keep something in the old jewelry box. If you're interested, the necklaces from left to right: wooden bead necklace from Target about five years ago, rose gold chain from Stella and Dot about two years ago, orange carved stone necklace that I picked up while in China, twisted chain with rhinestones from American Eagle about two years ago, mother of pearl beaded necklace I got in Hawaii when I was sixteen, dangle chain statement necklace from American Eagle about two years ago, white bauble necklace, vintage locket that belonged to my Oma, handmade stone slice necklace from a local vendor's fair/farmer's market in Salt Lake City about five years ago, leaves and chains necklace (I've scoured my memory and can't remember where it's from), treble clef necklace from choir in high school, Tiffany's bracelet given to me by my highschool boyfriend. The framed corkboard (approximately 18x24 inches) was given to us (this one is really cute but a little bigger. 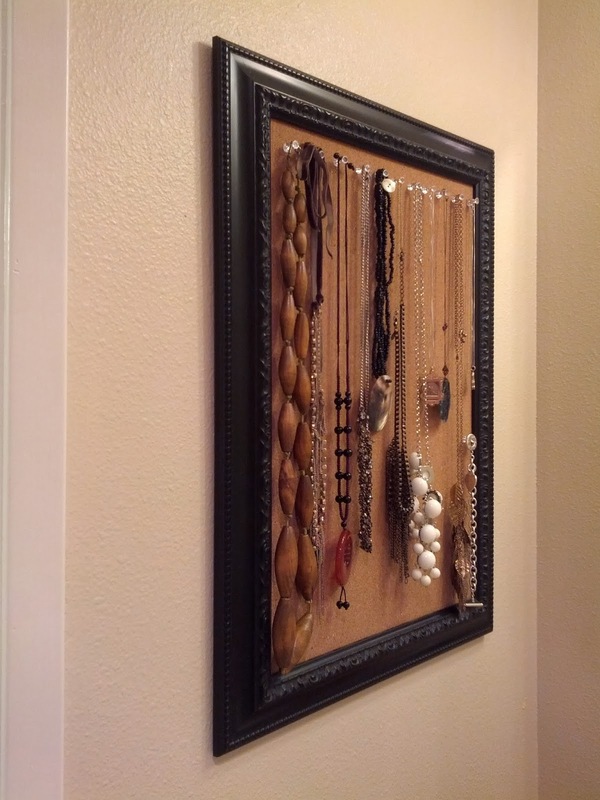 If you have lots of jewelry and a slightly bigger wall it would look cute). I so understand the struggle - I have some necklaces I really want to wear now but are "on hold" for the moment with a grabby baby. This is a great storage idea! Great idea! I use these knit mini scarves and push pin them to a wall and hang my earrings because they'll fit right through the little knitted holes. Yours is a bit more modern and not so hippy-ish as mine so I may be doing this soon for my necklaces! Thank you! Btw, I'm Sarah, and I'm a blog stalker of yours. I read your blog almost everyday! Love it!